This step in the retirement planning process drives to the core of the income plan. Here, you attempt to determine the amount of money that will be needed in the future to adequately fund the retirement income need that is not covered by “promised” benefits, such as Social Security or a pension. 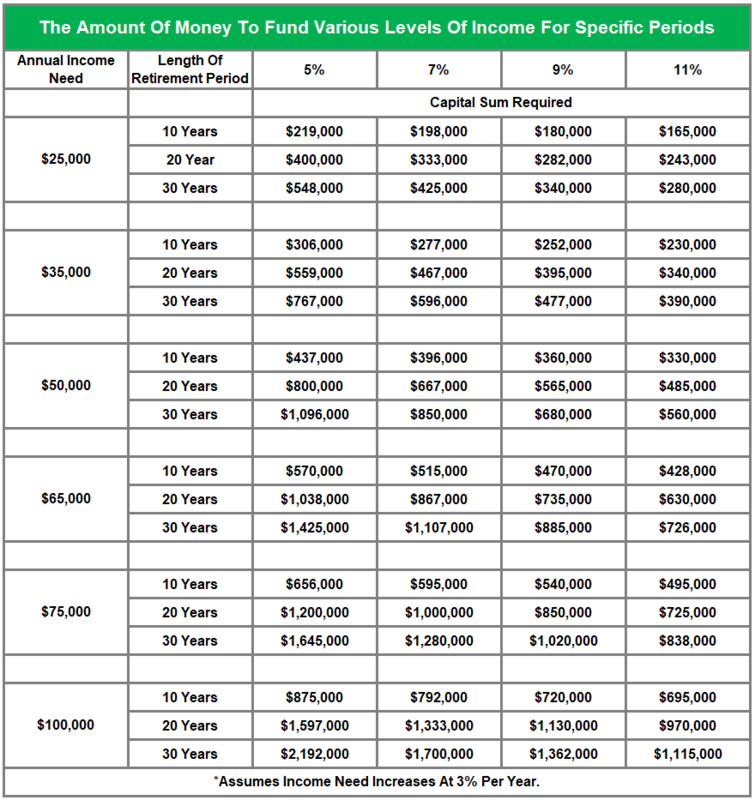 The table below provides an idea of the amount of money that will be necessary to fund various levels of annual income for 10, 20, and 30 years, based on various interest-earning assumptions. The calculations in the table assume an inflation rate of 3 percent and that the annual income need increases at the same rate each year. Once again, let’s return to the example of 47-year-old Ted. We determined that his annual income need upon retirement would be $86,000. Social Security and his pension will account for about $34,000; the remaining $52,000 must come from personal savings and investments. If Ted expects a 20- to 30-year retirement period (and assuming a conservative investment return of 5 percent over that period), we see that Ted will need a retirement fund of approximately $1 million to generate that additional $52,000 and to fully cover his later life income needs. If his pension is not indexed for cost-of-living increases, he’s going to need more.